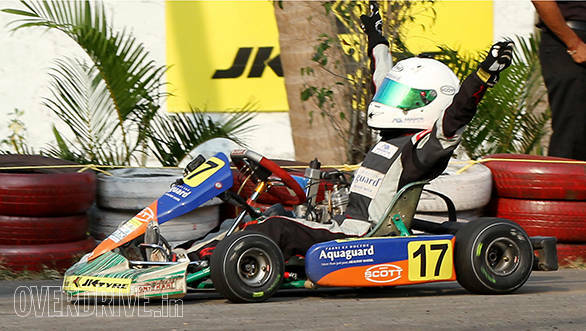 The JK Tyre-FMSCI National Karting Championship finale took place at a new venue this year at Visakhapatnam. The final round was scheduled a month ago but had to be postponed due to the devastation wreaked by cyclone Hudhud. The beachside track bore the scars as well, due to the water inundation with quite a few bumps and ripples forming in the tarmac around some of the corners. Kush Maini actually suffered quite badly for it with a crash that left him with a sprained muscle in his right arm. The doctors suggested that he avoid racing but like most racing drivers, he turned to pain killers instead and still managed to put up a very strong performance on the weekend. By the end of qualifying, Chittesh Mandody grabbed pole in the Senior Max Championship while Kush Maini and Yash Aradhya captured the top spot in the Junior Max and Micro Max categories respectively. The Micro Max Championship Race saw pole sitter Yash run a mature and controlled race to the chequered flag which gave him the championship. 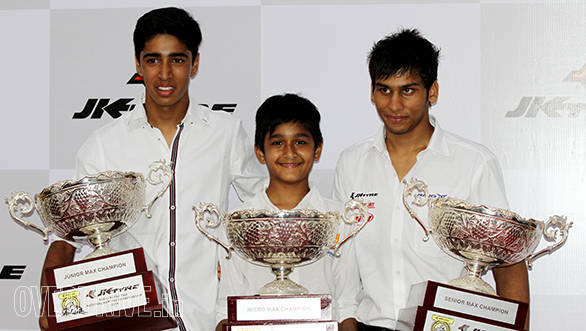 12-year old Yash has won four of the five races this year and is a name to look out for in the next few seasons. The Junior Max category saw some of the hardest racing with title leader Ricky Donison holding the lead in the initial part of the race but Kush Maini pulled off a brilliant move for the lead and finished on top. Despite the second place finish, Ricky sealed the championship. In the Senior Max category, Ameya Bafna of Rayo Racing captured the championship while the battle for second and third positions saw a lot of contention between Chittesh Mandody, Dhruv Mohite and Nayan Chatterjee in the two races held on Sunday. Chittesh won the second, comfortably ahead of Nayan and Dhruv, which allowed him to take second in the championship.